Treatment fees are subject to payment at the time services are rendered. Various employee benefit programs and health insurance plans offer coverage for Chiropractic Care, which includes Active Release Techniques®. Please refer to your plan documentation to see if you are eligible. I heard that once you go to a Chiropractor you have to go forever. Is this true? Not necessarily. Patients primarily contact us because they are experiencing pain or discomfort, which can normally be relieved in 2-6 treatments. Certain injuries may require additional treatments. In many cases, patients choose to come more regularly as they find our treatment enables their bodies to perform optimally by reducing the risk of repeat, chronic or new injuries. I’m a new patient, how long will my first treatment take? Please allow 30-40 minutes for your first visit. We recommend that new patients arrive 10 minutes prior to their first scheduled appointment. New patients are encouraged to print a copy of our Patient Intake Form and our Consent to Treatment Form and bring them with you on the day of your first office visit. Throughout this initial consultation, a medical history; as well as, a functional and orthopedic assessment (physical examination) is performed. Many of our patients are surprised by the array of symptoms we are able to address and resolve for them. With this in mind, if you are unsure as to whether your symptoms are treatable, please call our clinic at: 403.294.0095 for more information or to schedule an appointment. I’ve heard about Active Release Techniques® (ART®), but is it the same as Physiotherapy? No, ART® is not the same thing as Physiotherapy. ART® is a patented manual form of therapy utilized by Doctors of Chiropractic, Physiotherapists and Massage Therapists. A series of detailed protocols serve as the foundation for ART® through the manual application of tension along various muscle fibres throughout the body. ART® has improved the standard of manual care. Many of our patients report the practice of ART® as being able to effectively eliminate their conditions at a much faster and more predictable rate than other therapies have previously proven possible. ART® works to strengthen and refine all elements of the body system. It works to prevent muscle strains and injuries from developing as a result of excess muscle-joint tension and/or underlying structural weakness. ART® can also aid in the recovery of injuries or long-standing chronic conditions and assist in preventing a reoccurrence. This has enabled our patients to resume their activities-of-daily-living and excel in their athletic pursuits, pain free. The practice of ART® as a therapeutic approach to pain management; as well as, injury reduction and prevention facilitates a healthy lifestyle and supports the achievement of long-term health benefits for our patients. Most patients experience instant relief immediately following their treatment. Some patients report “it hurts in a good way” or describe a slight burning sensation. Depending on the nature of your physical disposition, in addition to the duration of your injury and tolerance to pain, there may be a brief period of tenderness after treatment, which can last for up to 24 hours. Most patients are able to resume normal daily activities, including sporting activities, on the same day of treatment. Some chiropractors run late and I have a tight schedule. Can you make sure I’m on time? We make every effort to remain on schedule. However, on occasion circumstances may arise where we run a little behind schedule. We ask for your patience and understanding in the event this occurs for you. Under these situations, please note that the quality of your treatment will be unaffected, as we take pride in assisting all our patients. Do you direct bill extended healthcare plan providers for treatment? 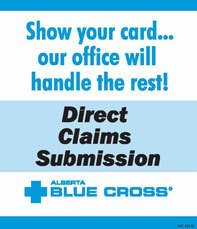 We are pleased to offer Alberta Blue Cross, Sun Life, Great West Life and Standard life direct billing services. For all other extended healthcare plans (EHPs) , payment is due at time of treatment, whereby receipts will be issued for submission to your EHP provider. Please ensure you are eligible for direct submission by contacting your provider. We accept cash, cheques, Debit, Visa, and Mastercard. Our cancellation policy allows for you to cancel your appointment up to 24 hours prior to the time of your scheduled appointment at no charge. Appointments cancelled with less than 24 hours notice from the time of your scheduled appointment are subject to the full cost of your appointment. In order to successfully assess, diagnose and treat our patients, our office requires medical information from each of our patients. We ask that you are prepared to provide a medical history of pre-existing and current conditions, including dates of operations, injuries, medications, etc. Also, please provide copies of any relevant examinations, such as X-rays, Bone Scans, MRIs that may assist in establishing a care plan that is best tailored to your needs. Our clinic is located downtown in the Watermark Tower, next to the CORE Shopping Centre. We are on the 15+ level next to Holt Renfrew. Suit 202, 530-8th Avenue SW, Calgary, Alberta T2P 3S8. What is the nearest C-Train stop?